So where do you go when you need a DB25 IDC connector right away? Arcade Electronics, which is just north of Springfield. Lots of good electronics, reasonable prices, no shipping if you just show up and buy it. I stopped by Scott Hutchison's studio last night. We are evaluating whether we like the behavior of Look better with active IR sensors or passive IR (PIR)sensors. The jury is still out. PIR sensors for home security systems generally operate like a relay. If there is "no intruder," they are either "normally open" circuit or "normally closed" circuit. I'm always scared of blowing out PC parallel ports, so instead of using potentially hazardous voltage pull-ups and pull-downs to detect whether relays are open or closed, I hook the relay between a parallel port output and an input. I then drive the output up and down a few times. If the input pin follows the output pin every time, you know the relay is closed. Otherwise, it is open. Opening Reception - Friday, January 13 from 6pm - 9pm. Other folks in the show include Scott Hutchison (who just got written up in a DC Magazine article), Claire Watkins (who does some really cool organic/technologic kinetic sculptures), David Page (who makes interesting "apparatus" that is sometimes fetish related). Sorry for the low quality, but here is the Canon SD400 with a Quicktime movie of the test rig for Blame. I am using Radio Shack magnetic reed switches which can operate with a gap of up to 1 inch between the magnet and the switch. I think the arm is swinging too fast, I'll have to turn down the PWM duty cycle. As an early birthday present, I got a Canon SD400. A very nice little camera! It came out pretty good, except for that little "zit" on the top, which I have since filled in with a little bit of stone. I attached the hand to a CPVC slip end cover using a masonry screw and a big gob of Loctite Epoxy Gel (which is supposed to work with plastics and ceramics). Later, I epoxied the CPVC slip end cover to the "arm" CPVC pipe. I have found a great site for "random" stuff like motors, power supplies, and PIR detectors: MPJA.com. Finally, the work I am doing with Scott Hutchison, now named Look, got mentioned at DCist. Not terribly tech-oriented, but last time I was in Chelsea, I saw these great glass sculptures by Mari Meszaros. I hate a lot of glass art, but like Tim Tate, Meszaros really has found a unique way of expressing through glass. Yesterday I stopped by Scott Hutchison's studio to do some work on Look, a work we are collaborating on with his great eye paintings and my computer and sensor technology. Scott took some video of his wife helping us test the work available here. We're still deciding if we are going to use active IR sensors or passive IR motion sensors. The behvior of the system is a bit different with active or passive. With active, you can sense someone who is in front of the sensor, but not moving. With passive, you can detect people very far away in a wide swath of area, but only if they are moving. I had no choice with Sycophant, as the head was moving itself, so motion detection was not practical, and I used active IR sensors in that project. In Look, the sensors will not be moving, so the choice is a bit harder. 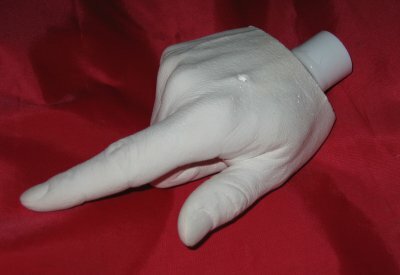 Last night, I made a casting of my pointing hand for Blame using a kit from Casting Keepsakes. It wasn't too tough to do, but you definately want to read the instructions fully, and use disposable bowls for mixing, because you certainly won't want to use them for anything afterwards. Unfortunately, I go to New York tonight, so I can't see how it came out until Saturday night. Check out the Windows Washing Machine! On my last trip to New York City, I saw work by Mark Napier at Bitforms (my favorite gallery). It allowed the viewer to manipulate a deformable wireframe model of the Empire State Building. It was a pretty fun interactive work!